The very act of combining rock music with classical qualifies music to land in progressive rock in my opinion. Of course, Darryl Way gets classified there at Music Street Journal anyway. Here we have his adaptation of the music of Vivaldi. This is a pure winner. I'd say that it probably lands more in the vein of pure classical music, but there is plenty of rock sound here, too. You'll probably recognize a lot of this music because the entire work is some of the more famous classical music out there. Everyone knows this melody. The cut takes a fairly straight classical treatment and adds some rock to the mix on the opening movement. It drops to more symphonic mellower stuff from there with some nature sounds in the mix. Then it powers back up to the earlier section to continue. The rocking movement later is just such a perfect marriage of the classical to the rock. Who knew you could head-bang to Vivaldi? There isn't a lot of rock in the mix on this one. The cut is more of a pure classical treatment. Still, it does feel fresh and different from the standard classical performance. This fast paced cut gets a nice blending of both the rock and classical sounds. Different sections of the piece seem to put the emphasis on one or the other as it makes its way forward. I love the rather somber tone of this piece. It's one that lands more firmly in the classical music vein. That said, it powers out into more of a full rock treatment as it makes its way down the musical road. This is really quite an effective powerhouse of a piece. It's dynamic and so cool. Starting with mellow classical tones, this begins to build up from there with more of a modern (but not precisely rock) take on the sound. Then a burst of rocking instrumentation brings it into a different vein. It drops down to more classical stuff from there. As it continues that is the general format, more purely classical stuff with bursts of rocking sound to accent it. A powerhouse classical meets rocking treatment is the basis for this piece. It's high energy and so cool. While not a huge change in terms of treatment, this one perhaps focuses more fully on the classical side of things. There is a powerfully beautiful musical concept to this piece. It is set more fully in a classical vein, but with a more modern vein to it. This is one of my favorite pieces here. It just captures to much magic and emotion. There is a bit more of a rock insistency to this piece. Yet, in terms of instrumentation and treatment, it's more pure classical than some of the other stuff here. It's a potent piece and another of my favorites of the disc. I love the violin work and melodic elements of this cut. Staying more in line with the classical sounds, this has some more modern things at play at times. It's another powerhouse cut. 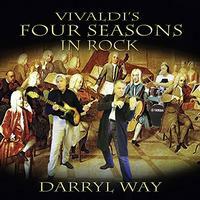 I again found myself head-banging to Vivaldi. More pure sedate classical music opens this number. That general musical concept holds the piece, another effective one. Another full classical treatment, this is a great piece of music, too.